This is the first Chinese New Year where there are three animals – the ram, sheep and goat. I think it is rather confusing! 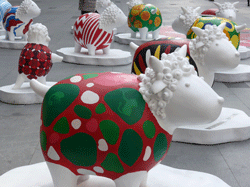 But it was great fun to see these colourful sheep outside a Shanghai department store. Children had fun climbing all over them and posing for photographs. 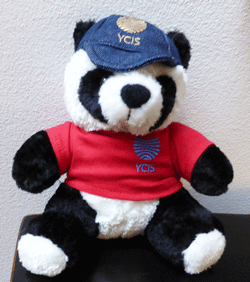 I was in Shanghai to talk at YCIS. They have a campus in Puxi, Pudong, and one in Gubei for older students. Thanks to Tania McPhillany who booked me for two days and it was rewarding talking to students. For the older students I included a talk on biodiversity and sustainability, something I see firsthand when I’m in the wild. I was given this cute panda mascot, which sits on my studio shelf.